1 External 3.5" 720k floppy. 1 External 3.5" 360k floppy. History : 08/23/97 : Acquired 2 external floppy drives for $4.00. 09/17/97 : Acquired base unit & monitor for $15.00. 08/15/98 : Acquired SM124 Mono Monitor for $2.00. 01/23/99 : Acquired ST BASIC Sourcebook and Tutorial manual for $1.95. 05/10/99 : Acquired SF354 with cables, PSU and manual for $24.50. 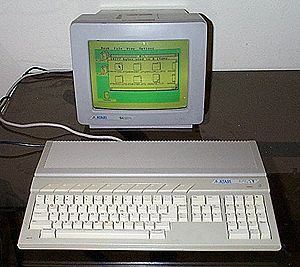 The Atrai ST line was a really very nice system given the price and features at the time. Still is in the music area with its built-in MIDI ports. Dubbed the Jacintosh since it was seen as a cheaper Mac-style system. Joe Rigdon picked this up at a thrift shop in Florida for me. Thanks Joe! I do need a couple of external floppy cables, manuals and PSUs for the external floppy drives. If you can help me with those or some doc and software, please email me.